Sixteen Counties is named to honor the rich tradition of farming in the state of Maine. The quality of Maine-grown malts for brewing has been steadily improving and we’re excited to be able to showcase these farms in a beer. As every grade school student in the state of Maine learns through song, there are “sixteen counties in our state.” It is in honor of these counties that Allagash Brewing Company has named its first new year round beer in two years: Sixteen Counties. Grains and malts in this new beer come from farms around Maine. Maine Malt House and Blue Ox provide malted barley (“base malt”), Aurora Mills Organic provides oats, and Maine Grains Alliance provides unmalted wheat. 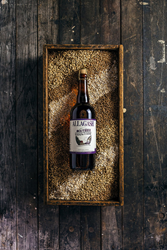 Allagash Brewing Company has used products from local farms dating back nearly a decade. Currently, they source fruits from Doles Orchards (strawberries, cherries, plums), Goss Berry Farms (raspberries), Applecrest Orchards (peaches), Pineland Farms (pumpkins, strawberries), Tavern Hill (blueberries). “We’re proud to donate a portion of the proceeds from this beer to help support organizations focused on sustainable agriculture and family farming in Maine,” says Allagash Brewing philanthropy program manager Kate Benthien. In 2016, philanthropic grant recipients will include MOFGA, Maine Grain Alliance and Maine Farmland Trust. Allagash was founded by Rob Tod in 1995, and has grown from a one-man operation into one of the Top 50 Craft Breweries in U.S. (by sales volume) and a spot on Maine’s Best Places to Work list for two years running. Allagash brews Belgian inspired beers and is best known for its flagship beer, Allagash White. Allagash has won many national and international awards in its 20 years, and is viewed as a leader of innovative brewing techniques in the craft beer world. Environmental and social responsibility is a core value at Allagash, and they are constantly working to lessen the environmental impact of their operations. Allagash distributes beer in 17 states and DC.